$899.00 This may be in stock for quick delivery; please call! Guitars in the LTD 1000 Series are designed to offer the tone, feel, looks and quality that working professional musicians require in an instrument. The PS-1000 marks the first 1000 Series offering for LTD’s exciting Xtone collection, high-performance semi-hollow guitars that sound and look equally great for metal as they do alternative rock, indie folk, or progressive. With the PS-1000, you get a set-thru 3-piece mahogany neck on a mahogany body, along with LTD locking tuners, a TonePros locking TOM bridge and tailpiece, and a set of overwound Seymour Duncan Phat Cat pickups, offering the midrange bite and unique attack of a P-90 single coil in a humbucker format. 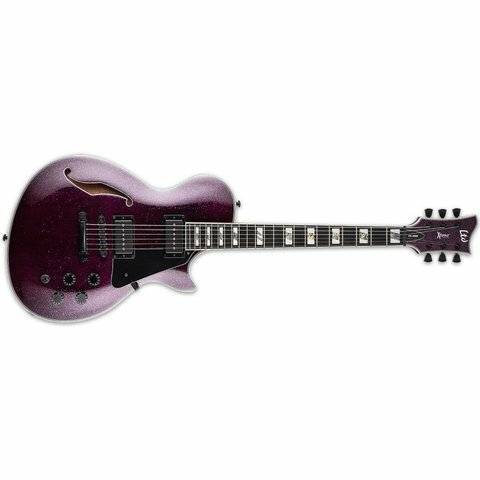 The PS-1000 is available in two versions: a flamed maple top in Violet Shadow Fade finish, or a solid top in outstanding Purple Sparkle finish.